Attendance at Christmas services in England’s cathedrals has broken records for the second year running, statistics published by the Church of England have shown. Attendance at Chester Cathedral for the season of Advent, Christmas and Epiphany rose by 35% from between 2014 – 2017 from 4600 people to 6200 people. The Dean of Chester, the Very Revd Tim Stratford says: “Christmas time is full of wonder and joy. The colours and shapes of thousands of lights that shine through the darkness on trees and in windows say this beautifully. In the church, one light shines out bigger and brighter than all the others. It is this great light with which all our other lights twinkle in sympathy. The great light that shines out is our celebration of the birth of Jesus. We know him as the one in whose life God touched the world as he never had done before nor since. His birth is a glimpse of heaven in our midst. 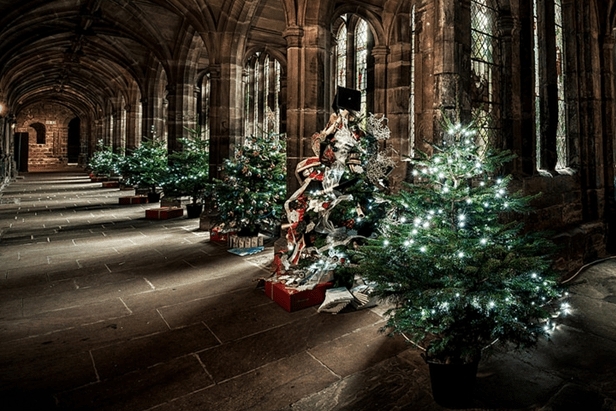 See what's on at Chester Cathedral this advent. While year-on-year changes to Advent and Christmas attendance can be affected by the number of Sundays in Advent and the day on which Christmas falls, numbers attending cathedrals on Christmas Eve and Christmas Day have increased by 13 per cent over the past 10 years, evidencing sustained growth. Meanwhile, more than 10 million people visited cathedrals (including Westminster Abbey) in 2017, with fewer paying for entry than in previous years. Cathedrals also reported having around 1,000 more volunteers in 2017 compared with the previous year. Cathedrals are increasingly used for an array of events, services and community engagement initiatives. In October, Chester Cathedral was the venue for the launch of Journey into Light, an exhibition of prisoner artwork which is currently touring 40 parishes around the diocese. An estimated 1000 people visited the exhibition hosted in the Chapter House of the Cathedral. Nationally, Cathedrals continued to be centres of civic life, with 1.3 million people reported at 5,300 civic services and events. In 2017, 289,000 people attended 290 graduation ceremonies.